They say a week's a long time in football, well that was certainly the case for the Hatters this afternoon. 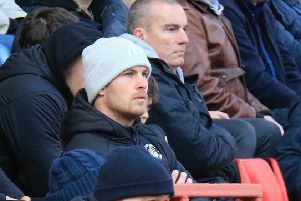 Eight-two winners over Yeovil last Saturday, Nathan Jones's side were brought back down to earth with a nasty bump , as they found out, if they ever needed reminding, just how difficult achieving their promotion ambitions will be this season, falling to a last-gasp defeat at Barnet. A game with precious little quality on offer was settled in the first minute of stoppage time when Jack Taylor took aim from 20 yards, curling his effort beyond Marek Stech and into the corner to ensure the points went to the Bees. Although never coming remotely close to anywhere near the heights they managed last week, defeat was still harsh on the Hatters as they should have come away with a point. But as it had last season, a loss of concentration in the final moments saw Town leaving empty-handed, and now without goal for the second game running too. That was mainly due to the homework clearly done by Barnet head coach Rossie Eames, as Town's assist king Andrew Shinnie was closed down by one if not two home defenders, while Isaac Vassell got little or nothing out of the Bees' backline too. The main news prior to kick off was that striker Vassell was well enough to return to the side after illness, with both Dan Potts and Alan McCormack back, as Luton reverted to the side who had hammered the Glovers seven days previously. The hosts were forced into a change after just five minutes, Elliott Johnson pulling up, Charlie Clough an early replacement. Town weathered the early pressure they found themselves under, and had a decent chance on 15 minutes, Vassell sprinting away on the right, rolling back to Jack Stacey and from his cross, Pelly-Ruddock Mpanzu side-footed tamely wide. Dan Potts then came within inches of putting the visitors in front, meeting a corner firmly, only to see Jamie Stephens superbly tip on to his own bar, with the rebound scrambled away. It was Luton who were calling for the substitutes bench on 20 minutes, captain Scott Cuthbert unable to continue after clearing the danger from Shaquile Coulthirst, Glen Rea on in his place. Town then looked to have settled down, gaining a semblance of control to force some decent opportunities, Alan Sheehan's free kick deflected behind and Alan McCormack's half volley off target. However, they could never fully test Stephens, who went on to have a far easier 90 minutes than he could ever have imagined ahead of the game against Luton's hotshots. Barnet then had to make their second enforced change of the afternoon, Harry Taylor off with a nasty cut to his lip, after a coming together with James Collins, Jack Taylor on in his place. The action didn't improve after the break either,.Jamal Campbell-Ryce whizzing an effort well wide, with the Bees, as they had in the first half, beginning with a spring in their step. Stech was called upon twice, first parrying Campbell-Ryce's curler and then getting everything behind Mauro Vilhete's low drive. Town only ever threatened sporadically, Collins's cross shot whistling through the area and Sheehan's free kick required punching clear by Stephens. However, late on Taylor took centre stage to earn Barnet the points, as Town tried for a grandstand finish, but Elliot Lee's header was tipped over by Stephens, leaving the visitors scratching their heads as to just how so much can change in those seven days. Barnet: Jamie Stephens, Elliott Johnson (Charlie Clough 6), Ricardo Almeida, Santos, Michael Nelson (C), Curtis Weston (Wesley Fonguck 70), Jamal Campbell-Ryce, Shaquile Coulthirst, David Tutonda, Harry Taylor (Jack Taylor 35), Mauro Vilhete, Jean-Louis Akpa Akpro. Subs: Craig Ross, Simeon Akinola, Ruben Bover, Justin Amaluzor. Hatters: Marek Stech, Jack Stacey, Dan Potts, Scott Cuthbert (C Glen Rea 20), Alan Sheehan, Alan McCormack, Olly Lee, Pelly-Ruddock Mpanzu, Andrew Shinnie (Jordan Cook 70), Isaac Vassell (Elliot Lee 88), James Collins. Subs: James Shea, Johnny Mullins, Harry Cornick, Luke Gambin, Elliot Lee. Booked: Jack Taylor 52, Campbell-Ryce 81, Rea 83.